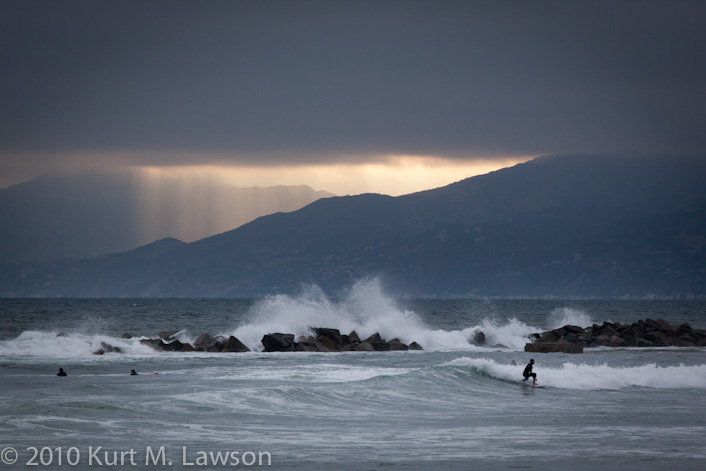 Yesterday I took a bike ride along the coast of Santa Monica Bay. 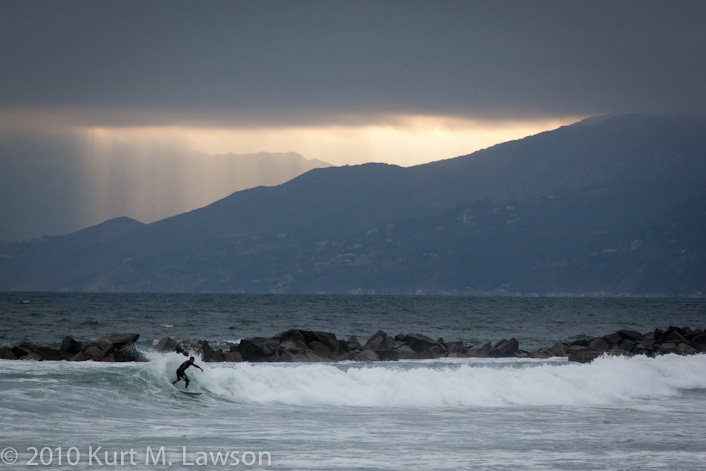 While this was mostly just a recreational trip, I found that the gloomy marine layer that extended from Santa Monica to El Segundo had opened a hole over Malibu, and that this provided a stunning backdrop to some surfers that I happened to notice as I rode by on my bike. Had I not looked up at this moment I would have missed it. I hauled my bike into the sand and shot a series of pictures as the light faded. I had taken my entire photo kit sans tripod with me and was glad I did as I whipped up my new 100-400mm zoom lens to frame up these shots. This was quite a magic hour! The waves crashing over the edge of this break wall in Venice is what caught my eye in the first place. The waves were splashing 20 feet into the air. 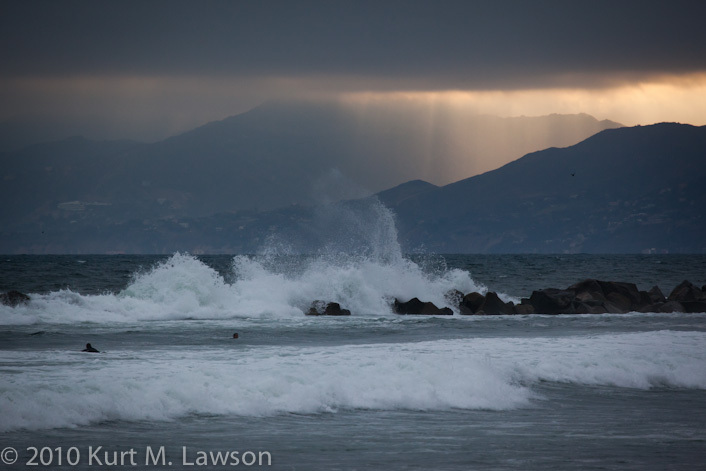 I don’t know what it was about the air – perhaps moisture content – but looking towards Malibu revealed this mirage like image of an island. The island is of course not an island, but rather the ancient rock of Point Dume at the far west end of Santa Monica Bay. Not all the shots from the trip were at the one spot. Here are a few others from different parts of the coast. This boat was right at the edge of the massive marine layer cloud, with the water in front in direct sunlight while the boat was in shadow. These two photos are from a fenced off area that allows these birds to hang out without human and pet disturbance. I believe they are Great Blue Herons and there were four of them when I went by in Marina Del Rey. They are big, pretty birds. Finally here is a little time lapse I did showing the movement of the marine layer cloud taken from the edge. This is approximately 10 minutes sped up to last only 38 seconds.